Have some bubble-tastic time with these great (60ml) Bubble Tubs and wand! Perfect for play or party time anywhere and make great gifts for Party bags and pocket money purchases. 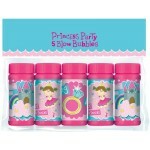 Princess bubbles (5 x pack) This 5 pack of Princess Party bubbles comes with wands .. GIRLS BUBBLE TUBS PARTY PACK BUBBLE MAGIC WITH WAND 60ML - Have lots of fun with this great val.. GIRLS BUBBLE TUBS PARTY PACK BUBBLE MAGIC WITH WAND 60ML - Have lots of fun with this gre..